IBM Tivoli Dynamic Workload Broker is a key element in a comprehensive, on demand, Tivoli workload automation portfolio. It can use dynamic resource information as well as recommendations from other products to determine the best systems to which new jobs will be dispatched. 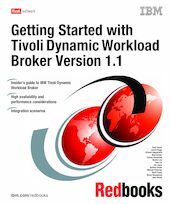 This IBM Redbooks publication documents the architecture, installation and customization, operation best practices, performance optimization, high availability considerations, Web Services interface, and troubleshooting of Tivoli Dynamic Workload Broker V1.1. In addition, we cover integration scenarios with other IBM products, such as IBM Tivoli Workload Scheduler, IBM Tivoli Provisioning Manager, IBM Tivoli Change and Configuration Management Database, IBM Tivoli Monitoring, Tivoli Enterprise Portal, and IBM Enterprise Workload Manager. Finally, we discuss Tivoli Dynamic Workload Broker operation in a IBM Tivoli Workload Scheduler for a z/OS end-to-end environment. Clients and Tivoli professionals who are responsible for installing, administering, maintaining, or using IBM Tivoli Dynamic Workload Broker will find this book a major reference.